The Coral Dart is tied for clear water stalking on small stillwater fisheries when the fish started to wise up late on in the day. To achieve a fast sink rate a small 1 mm tungsten bead is used. The combination of the bead and the lama mix tail makes for a very mobile pattern which can be fished on-the-drop to intercept the fish or on-the-lift. Thread : Sparton Professional, red. Tail : Veniard's coral pink lama mix. Body : Veniard's Micro-Brite extra fine chenille, pink. Collar : Glo-Brite Fluorescent red floss, shade 4. Head : Gold 1 mm tungsten bead. 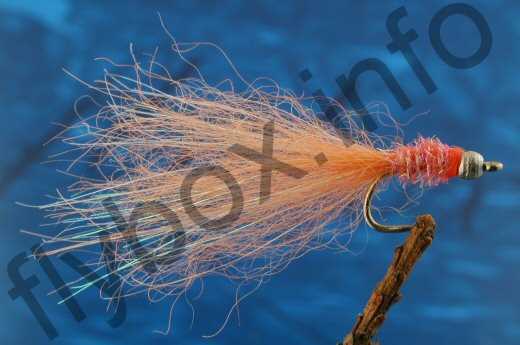 Currently there are no comments about the Coral Dart fly pattern from other fly fishermen yet.